I attempted to contact Mark Allen Photography via their website to get permission to use this really cool photo, no reply so, stolen…. The weekend adventure actually started on Friday, I was driving my new VW Alltrack to the dealer so that I could hopefully have them remove the passenger side headrest that I was unable to remove. The headrest removal would allow for DN sails and boom to be stowed easier and neater. On the way to the dealer, traffic on Rt1 2lane north 2lane south was going slow due to traffic lights and moderately heavy traffic. I was going 10-15mph inside lane north when unbeknown to me a giant pickup truck in the right lane waved a young lady attempting to pull out of a credit union parking lot and go south to cross in front of him. The young lady could not see me, or I her, as she gassed it just as I was passing the giant pick up truck. So, for now it matters not about the headrest and the efficient storage of DN boom and sails, as the Alltrack is in the bodyshop. Fortunately I was able to get a rental vehicle that would allow the use of my roof racks, and had room for all my gear. It was a Subaru Forester and interestingly the passenger side headrest is removable. I was able to pack the Forester and was ready to head to Dammy in no particular hurry as the wind was whistling and I did not expect to sail on Saturday. What I did want to do, was get to the launch when still light, so that I could get the DN onto the ice, so one less thing to do on the morning of the race. I arrived in Damariscotta at about 1500 and went to the Lake Farm to see if there might be a room, and it was my lucky day a single room was. I then went down to the launch and into the office building next to it and went in. There were several sailors in there staying warm and talking. Sure enough, it was not too long before 3 or 4 volunteered to help me get my boat onto the ice. Kate, and John were two of them, and I do not know the names of the others, I apologize I am terrible with names. 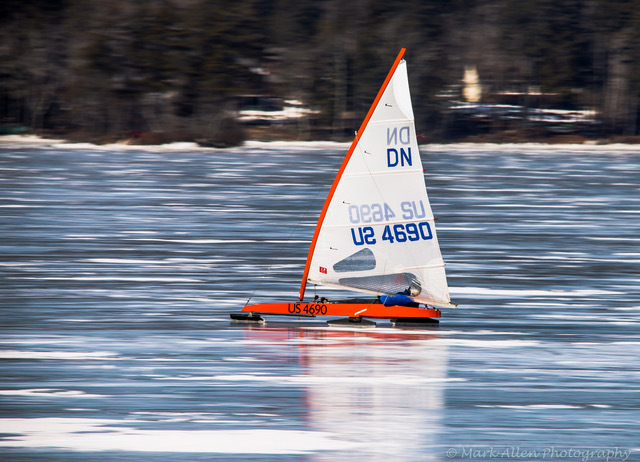 In no time, in those really cold temps, my boat was on the ice, mast stepped and anchored to the ice. So, up to the Lake Farm for a couple of drinks and a terrific stuffed haddock meal we went. A few text messages were sent while sitting at the bar. I was announcing the ice that I saw when launching, and hoping for a few more boats on the line. As we ice boaters do, it was to bed early anticipating the loss of an hour to daylight savings adjustment that night. Up early it was, and the Lake Farm has a nice kitchen available to the guests with coffee and fresh muffins and stuff. In addition to that James Lamb started cooking eggs, sausage and brewed some real coffee in a percolator, so I started the day with plenty of grub. I then went out to start my rented Forester and was greeted with a DEAD battery. We had no jumper cables so Chris and James were kind enough to push me out of the driveway, and across the road, and down the hill to the lake I coasted. I then was able to borrow a set of jumper cables from Dan Clapp, and then start my car to warm it and charge the battery. There were so many boats on the ice, that it was difficult to find all the DNs on the ice, and determine those that were going to race. Because there were as many as 40 boats on the ice (did anyone get a accurate count?) finding the DN racers was a bit difficult. We walked around with the registration sheet as best we could. Fortunately, Doug and a couple of the racers helped, as I am not able to run around on the ice as in days of old. We did get 9 sailors on the registration sheet, so things were looking good. As I finished getting my boat ready, Guy was doing the same. He had a newly constructed side car and volunteered to carry the marks, and scoring equipment out to the line. Fortunately I remembered (actually went back to my house after getting about 5 miles away) to bring the marks. Guy helped me check the marks to make sure they were good to go, and fortunately he and I had an ice screw that could be used for each. We tried to/wanted to have a skippers meeting in the launch area, and that did not really happen, so somehow we decided to go out and set the course. We were counting on the magnetic attraction of the leeward mark and starting line to do its thing. Guy started setting the windward mark, I went down wind approximating the lay of the course from where he was, and then sailed back to where he was. We decided to set it about 200yds more to the west. When we were out there setting the marks the wind was a bit gusty and shifting back and forth by about 40-60 degrees. The wind did this all day, but our marks were square to the average. The shifts did not last for the length of a race or even a leg so all was fair, but frustrating. We set the leeward mark and sure enough the magnetic attraction of the race course did its thing. For the first race we set the start line and decided to do the first race self start, and Doug yelled the start sequence, off we went into the shifty, gusty wind. The first race was tough, at least it was for me, deciding where the lay line is when the wind was shifting as it was, is tough. The self start is doable the self finish is/was a bit more questionable, but we unanimously agreed that the first boat downwind of the leeward mark was first, and rounding was not required. Fortunately, Lloyd arrived, and he along with Pat who decided the way of the day would be best officiating, scored the next 4 races. I have to say, the Chicky self start system does work, but having a real starter is the best! And from what they have told me those leeward mark roundings were a good watch. I only know from my experience on Sunday they were exciting for me, and I did make a couple of roundings as I intended. Man, those 1/4 inch inserts with 20inch profile were the runner for the day. I did slide out several times, but it was not the runners fault it was my tiller handling while attempting to sheet in. I have got to say as challenging as those leeward mark rounding are, a nicely done windward mark rounding is super satisfying. Rounding the mark with good speed, and accelerating as you bear off is one of the best things about racing. The sun was not helpful for the first few races, as I could not see my leeward telltales, and we all know how important that is. Several times I stalled so badly due to wind shift and/or not seeing the tells that jibing was the thing to do. A couple of times Doug and I rounded at the same time and a drag race with those gusty shifty winds happened. After the first two races it looked as though things were going to be tight, but in the third race Doug had an equipment breakdown DNF. So, after three races Bishop was ahead by one point, but being nagged by a very painful neck. I was able to convince him to continue racing as we all like to race at least 5, so that we can throw out worst. The wind was the same for the final two races, but the suns angle was better for my downwind legs, and I was able to see my leeward tells, I was smokin’. Both Guy and Doug were having mast issues that were negatively effecting their performance, while I was having mast issues that were positively effecting my performance. I really should have moved the mast step forward, so that the mast would have bent less. It is a truly amazing piece of equipment that CSI mast. I did have my custom batten installed in the mast, and that definitely helped. There were many cruising boats on the lake, but all did their best to keep clear and give way to us DN racers. I must say those nice racing marks that Steve Madden donated to our club helped. I have gotta take the time use that gopro camera that I have and never use. I think that I can speak for all, we had an exciting day of DN racing! I do wish that we had a few more racers on the line, and they know who they are. Some had good excuses like equipment in another country, others did not have good excuses. This report took a couple of days, a bit late, I had to service my snowblower, and it takes a bit of time for a guy my age to remember important race facts. I know much of this report sounds as though it is about me, it is, I am the Maine State DN Regatta Winner. I was just about to post this article on Tuesday afternoon, and at 1345 the power at my house went out. It is now Wednesday 2130 as I complete the task.